The Cranbrook School? Doesn't ring a bell. “They talked about the fact that I played a lot of pranks in high school, and they described some that, boy, you just say to yourself, back in high school, you know, I did some dumb things. If anyone was hurt by that or offended by that, obviously I apologize. 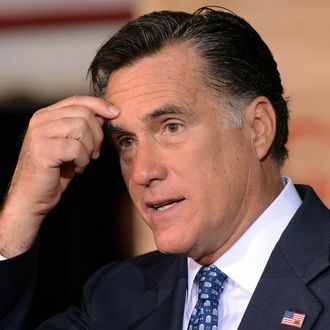 But overall, high school years were a long time ago,” Romney said on the “Kilmeade & Friends” radio program. “I don’t remember that incident and I certainly don’t believe I or — I can’t speak for other people of course — thought he was homosexual. That was the furthest thing from my mind back in the 1960s, so that was not the case. But as to pranks that were played back then, but high school days, I did stupid things, and I’m afraid I have to say sorry for it,” Romney said. Romney’s apology comes a little too late for John Lauber, the gay kid whose alternative haircut so offended him — he died from liver cancer in 2004. But you never know — maybe Romney’s blanket mea culpa just got him crossed off a “People to Kill” list somewhere.